Ole R. Dahl had studied topography and surveying at a military academy in Trondhjem, Norway, prior to coming to America. In response to a call by Colonel Hans C. Heg for volunteers in September, 1861, Ole attempted to enlist his own company f men for the 15th Wisconsin. When that did not succeed, he enlisted as a Private for a 3 year term of service under Captain Knud J. Sime in Company H of the 15th Wisconsin on October 29, 1861, at the Town of Chippewa (now Chippewa Falls), Chippewa County, Wisconsin. Company H called itself "Heg's Rifles," but was also known as the "Voss Company" because so many of its members hailed from that area of Norway. At the time the Army listed Ole as a Farmer residing in the Town of Bloomer Prairie, Wisconsin. On July 1, 1862, at the Town of Humbolt, State of Tennessee, Private Dahl was promoted to Regimental Quartermaster Sergeant on the Field & Staff. This unusual 'jump' in ranks was probably due to his prior military training in Norway. However, on August 7, 1862, he was reduced to ranks at his own request and transferred back to Company H.
Seven months later Private Dahl, at the recommendation of Colonel Heg, was commissioned as the 1st Lieutenant (second-incommand) of Company B by the Governor of Wisconsin on March 15, 1863, at the Town of Murfreesboro, Tennessee. Company B called itself the "Wergeland Guards" in honor of the famous Norwegian writer and poet, Henrik Wergeland. Ole was mustered in at Murfreesboro as 1st Lieutenant on March 18, 1863, with his rank to date from March 15, 1863. At the time the commander of Company B was Captain Joseph Mathiesen and its third-in-command was 2nd Lieutenant Ole P. Olson. After only a few weeks Lieutenant Dahl was detached from the 15th starting April 3, 1863, to serve as "Topographical Engineer" of the 2nd Brigade in the 1st Division, 20th Army Corps. He is reported to have been a very good surveyor and was praised for his maps. To see a portion of a map he drew of Camp Erickson near the Town of Jacinto, Mississippi. On May 1, 1863, he became the Topographical Engineer of Colonel Heg's newly formed 3rd Brigade in the 1st Division of the 20th Army Corps. It was with Heg's Brigade that he served during the September 19-20, 1863, fighting at Chickamauga, Georgia -- the second bloodiest battle of the Civil War. He apparently survived that battle without injury. When Heg's Brigade was dissolved in October, 1863, and the 15th became a part of the 1st Brigade, 3rd Division, 20th Army Corps, Ole became the Topographical Engineer on the staff of the brigade commander, U.S. Brigadier General Augustus Willich . Lieutenant Dahl was captured by Confederate troops near Morristown, Hamblin County, in East Tennessee, on March 7 or 18, 1864. He was then held as a prisoner of war for nearly a year. He later stated he had been in 32 different Confederate prisons during that time, including: Libby Prison in the City of Richmond, State of Virginia; Camp Oglethorpe in the City of Macon, Georgia; the former U.S. Marine Barracks at the City of Savannah, Georgia; and Asylum Prison, Richland Jail, and Camp Sorghum, all in or near the City of Columbia in the State of South Carolina. On March 1, 1865, Lieutenant Rasmussen was one of a thousand Union officers released by the Confederates near the City of Wilmington, South Carolina. Here is a portion of his account of the release. "We were then marched about a mile and a half, when, suddenly turning a bend in the road, the "Old Flag," for the first time, greeted us. A cheer went up from the head of the column, which ran along its entire length, to be repeated time and again, till we had cheered ourselves hoarse and were exhausted...As we marched past it, with uncovered heads, the band played "Hail to the Chief," etc.Many of the old prisoners stepped out of ranks, embraced and kissed the "Starry Banner" with tears-- an old friend, from whom they had long been separated." Lieutenant Dahl was mustered out of Federal service on March 12, 1865. This was a month after the expiration of his 3 year term of service. Within the year he published a booklet detailing his prison experiences, illustrated with a portfolio of drawings he had made. 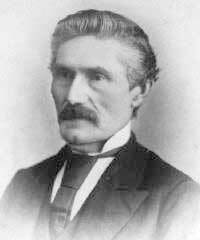 Later Ole R. Dahl became a State Land Agent in the Town of Tomah, Monroe County, Wisconsin. It is said that for many years a drawing by him of the Stone River, Tennessee, battlefield hung in the State Adjutant General's office in Madison, Wisconsin. Much of the visual impact available on these pages is due to the work of this man. His drawings give depth to what otherwise might be two dimenation views of this subject. His book details other drawings on this subjsct which I would love to work into this page.